A year after taking the helm of eBay in 1998, Meg Whitman made what she called one of her biggest blunders—missing out on the huge Internet market in Japan. In an interview with CNBC, Whitman said the fledgling online shopping and auction site had to repair its existing website from a major outage caused by rapid growth overwhelming a shaky and underprepared website. That caused eBay to miss a window into Japan, which was the world's second-largest Internet market at the time, Whitman, now the CEO of Hewlett-Packard, said. "It just taught me—follow your intuition," Whitman said in the interview, which aired Tuesday on "Squawk on the Street." "I had a sense that the technology underpinning eBay was not going to help us scale where we needed to. That miss of eBay Japan is one of the big failures of my time at eBay." Whitman, who was named No. 18 on CNBC's First 25 list, was the only woman to have led two large U.S. corporations in eBay and Hewlett-Packard. The companies couldn't have been more different when Whitman assumed the chief executive positions. In 1998, eBay was a 3-year-old start-up with 30 employees and revenue of less than $5 million. When she left a decade later, the auction site had $8 billion in sales, 15,000 workers and operations in 30 countries, despite the missed opportunity in Japan. Whitman came to HP in 2011 to turn around a 72-year-old tech stalwart suffering from a rapidly changing PC market, as laptops, smartphones and tablets entered the space. HP had lost $30 million in market capitalization by the time Whitman became CEO. In her interview with CNBC, she said a second noteworthy failure was her 2010 gubernatorial campaign in California against Democratic opponent Jerry Brown. She spent $144 million of her own money on the race—and lost. 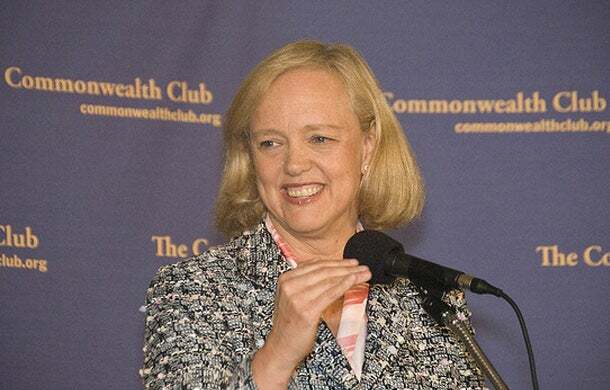 Whitman said she developed a newfound communication prowess through the defeat, which helped her take control of a global company with a payroll in the hundreds of thousands. Whitman said she doesn't think she'd ever run for office again. "What I learned was it's not the facts and figures," Whitman said. "It's not the left brain. It is the stories you tell to communicate the vision that you're trying to get the organization to rally around. ... I put everything I had into [the campaign]. But it didn't work out the way I hoped. I learned a lot from it and I think it made me a stronger executive and I think a stronger person."